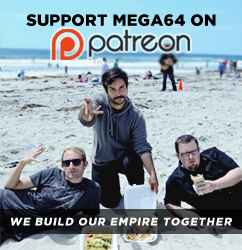 IS MEGA64 PODCAST 388 THE MOST COMFORTABLE PODCAST EVER? This week's Mega64 Podcast may be more intimate than what you're used to. That's because it's the official "ComfortCast." Shot in a Chicago hotel room, this show was designed to make you feel maximum intimacy with the Mega64 boys. On top of that, we also discuss PlayStation VR, PS4.5, pizza, Her Story, and other incredible delicacies. Watch below or... listen to the audio version if you absolutely need to.